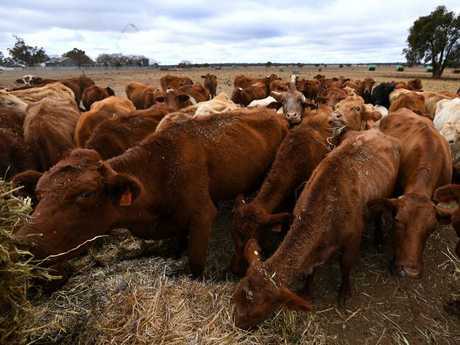 ALL Australians could soon feel the effects of the drought in surging food prices, as the long dry takes a "significant" bite on the economy, the Reserve Bank governor has warned. The drought is so bad Philip Lowe said the RBA board was now studying rainfall charts. "If it goes on like it did in the drought at the turn of the century, then the effects on the economy are significant," he said. Mr Lowe's evidence to a parliamentary inquiry yesterday came as a new Commonwealth Bank report warned of food price hikes and said the cost to the economy could be $12 billion. 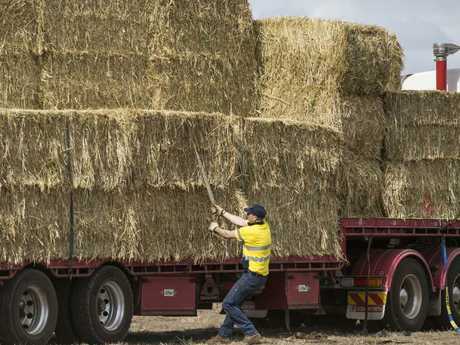 There was some relief for the bone dry bush yesterday with the arrival of a convoy of 23 trucks carrying 1200 tonnes of badly needed hay for drought-stricken NSW farmers. But the feed, valued at $660,000, will only buy a week's respite for the farmers queuing to load bales onto their trucks at Condobolin. What they need is rain. "This hay will only last a week but it is very important," said Natasha Peasley, who runs 5500 sheep with husband Shane on their farm 70km north of Condobolin. "It shows that the community is supporting us. The drought is mentally draining, it is depressing. "People are not just burying sheep, they are burying family members now." Her husband added grimly: "This hay will definitely prevent some suicides." The 2300 bales of hay were paid for with a donation from the Christian Plymouth Brethren charity's Rapid Relief Team and was trucked across in a convoy from Western Australia. 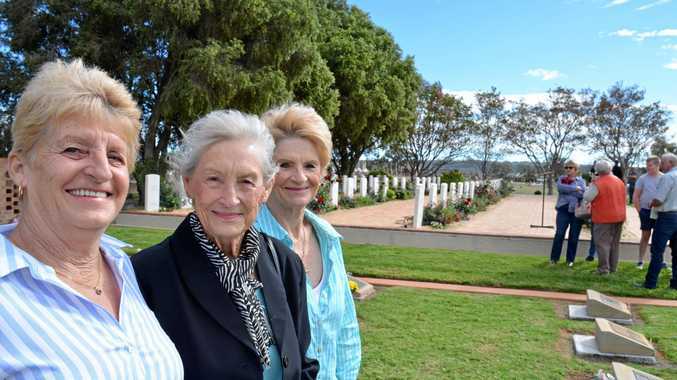 Truckie Glen Chapman, who donated his time, said the convoy had been cheered and supported right across the country. "People have been waving and smiling. Normally they are giving us the finger," he laughed. Federal MP Angus Taylor said the donation was an inspiring example of "the Aussie spirit of getting in and helping your mates". Lachlan Shire Mayor John Medcalf added the delivery was "a fantastic help in the short term" to help farmers coping with two failed harvests and virtually no rain in the past 12 months. "The lack of feed is now forcing people to sell off their stock and they are coming down to their core breeders. People are paying $1000 a day to truck in feed for their stock and some hard decisions are going to have to be made," he said. 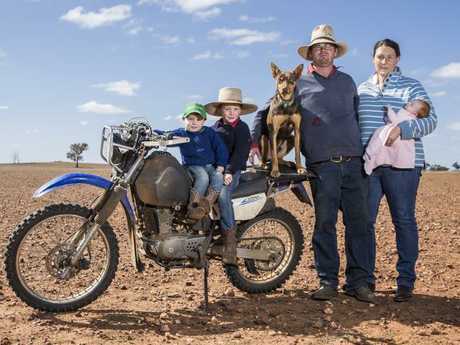 Most eyes are on the state government and its $1 billion drought relief package, which many farmers complain is tangled in red tape and too difficult to access. So far the government has approved just 150 of 357 applications, worth $7 million, to the Drought Assistance Fund. Deputy Premier John Barilaro told the farmers in Condobolin "if it doesn't rain there is more to come". Mr Barilaro also took a shot at the supermarkets who cut prices - selling products such as milk for just $1 a litre - leaving farmers with less money in the bank to cope when the bad times come around. "Pay them the right price at the time when they are producing," he said. Farmers are exhausting savings and borrowing cash to keep stock alive. Farmer Spike Orr runs 6000 sheep and grows cereals on a 3200ha spread near Parkes. He said yesterday: "We have been dry for 12 months. It is like someone just turned the tap off." Spike is trying to buy feed for his sheep and has seen the price per tonne double in the last 10 days. It is also affecting his young family - wife Kate, 34, and their four children, Anna, 7, Lachlan, 5, Archie, 2, and baby Imogen, who is just seven weeks old. "There is no down time," said Kate. "All our time is spent carting water and feed. If Spike comes in for lunch we are on Excel spreadsheets working out how to adjust the feed and ringing around trying to find where to buy it." 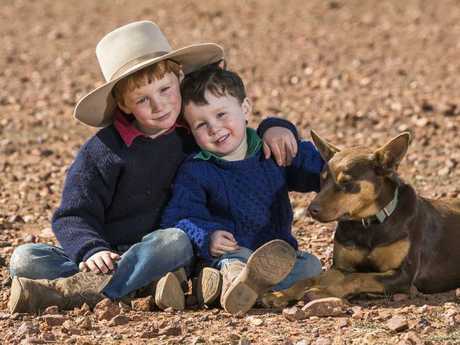 "Just two years ago we were marking our lambs in flooded paddocks. "We try to keep looking on the bright side. But there is a non-pretty reality to it." Aussies have dug deep. The Rapid Relief Team raised almost $3 million in two weeks. Commonwealth Bank customers have raised $4 million, with the bank adding almost another $2 million to a Red Cross fund that stands at $8 million. Every cent will be needed. Normally western NSW can expect up to 600mm of rain but this year it has received as little as 50mm. The winter rainfall is down from as much as 200mm to just 30mm. Bureau of Meteorology spokesman Mohammed Nabi said: "The next three months are forecast to be well, well below average for rainfall." And that means next year will also be bad because there is nothing growing in the state's red parched paddocks. 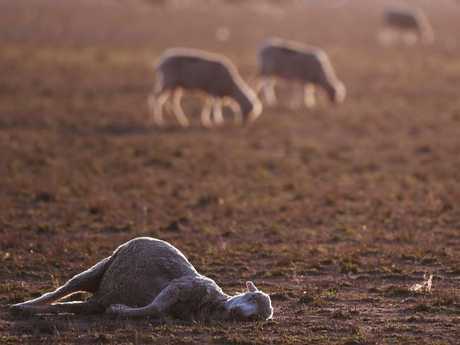 The state Department of Primary Industries lists more than 99 per cent of NSW as affected by drought in some way, with 21 per cent listed as suffering "intense drought". 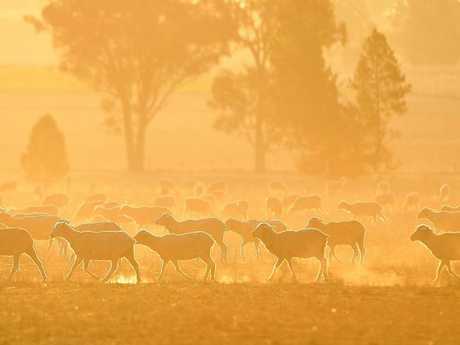 A scarcity of fat lambs because of the big dry has led to record lamb prices in some areas of the state.